These components introduce a DOCSIS QoS Service Flow management using the PCMM protocol. The driver component is responsible for the PCMM/COPS/PDP functionality required to service requests from PacketCable Provider and FlowManager. Requests are transposed into PCMM Gate Control messages and transmitted via COPS to the CCAP/CMTS. This plugin adheres to the PCMM/COPS/PDP functionality defined in the CableLabs specification. PacketCable solution is an MDSAL compliant component. The packetcable maven project is comprised of several modules. packetcable-driver A common module that containts the COPS stack and manages all connections to CCAPS/CMTSes. packetcable-emulator A basic CCAP emulator to facilitate testing the plugin when no physical CCAP is avaible. packetcable-policy-karaf Generates a Karaf distribution with a config that loads all the packetcable features at runtime. packetcable-policy-model Contains the YANG information model. packetcable-policy-server Provider hosts the model processing, RESTCONF, and API implementation. Install the odl-mdsal-apidocs feature from the karaf console. Navigate to the PacketCable section. Editing yang can be done in any text editor but Yang-IDE will help prevent mistakes. Select the interface to monitor. Use the Filter to only display COPS messages by applying “cops” in the filter field. 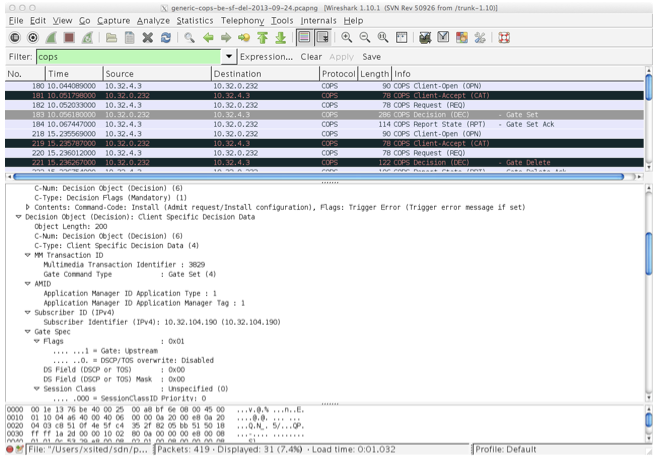 Wireshark looking for COPS messages. Below are some of the most useful CCAP/CMTS commands to verify flows have been enabled on the CMTS. show cable modem 00:11:22:33:44:55 service flow   ???? Checkout the integration project and perform regression tests. Check and edit the integration/features/src/main/resources/features.xml and follow the directions there. Install the container as a system service in the OS. The display name of the service. The description of the service. before installing and starting the service.